David R. Blasko is currently Director of Animal Care at The Mirage Hotel & Casino. David as past Director of Animal Operations at Six Flags Marine World, was responsible for all aspects of the care and husbandry for a diverse collection of more than 3,000 mammals, birds, reptiles and invertebrates of the land, sea and air. Species in his charge included African and Asian elephants, killer whales, bottlenose dolphins, Pacific walruses, California sea lions, Pacific harbor seals, Bengal tigers, mountain lions, primates, giraffes Magellanic penguins, hornbills, a variety of raptors, parrots and other birds, sharks, coral, warm- and cold-water fish and invertebrates, butterflies, white-throated monitor lizards and lesser anteaters, among others. Blasko began his career at Sea World of Ohio, and came to the Six Flags Marine World park (then Marine World Africa USA) in 1982, serving as Elephant Training Supervisor for 20 years. 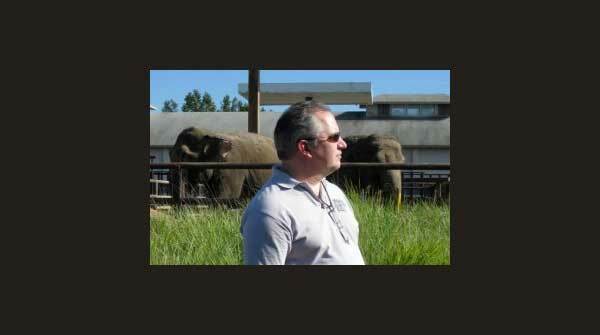 A respected consultant on elephant care, training and safety for other zoos, government agencies (USDA/APHIS, U.S. Fish & Wildlife Service, California Fish & Game, etc. ), and to private owners, Blasko is past president of the national Elephant Managers Association and an instructor for the Principles of Elephant Management School of the American Zoo & Aquarium Association. He served on the steering committee of the Asian and African Elephant Species Survival Program management group, helping preserve elephants in zoos and in the wild. 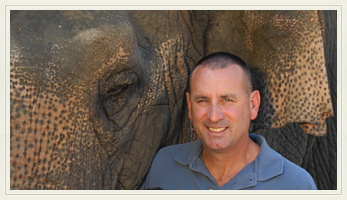 During his tenure at Marine World, Blasko and the elephants in his charge participated in groundbreaking efforts to establish and refine artificial insemination techniques and procedures for African elephants. Scientific studies benefiting elephants in zoos and in the wild, including work with elephant foot care, dental care, ultrasonic communication, chemical communication, locomotion, DNA analysis, and pioneering veterinary care procedures including infrared light treatments were among Blasko’s cooperative research efforts at Six Flags Marine World. He presented papers on elephant care at numerous Elephant Managers Association and American Zoo and Aquarium Association conferences. Blasko is on the Board of Directors of The International Alliance of Marine Mammal Parks and Aquariums and a past board member of the International Elephant Foundation. He is past president of the Elephant Managers Association and a professional member of the American Zoo and Aquarium Association. Blasko holds a Wildlife Law Enforcement certificate from the California Department of Fish & Game. Robert H. I. Dale, Ph.D. is a Professor of Psychology at Butler University, where he was department head for 6 years. He teaches undergraduate psychology courses on animal learning and evolutionary psychology, and an honors course on elephants. In the past he has examined several aspects of animal learning and memory, and of human memory. 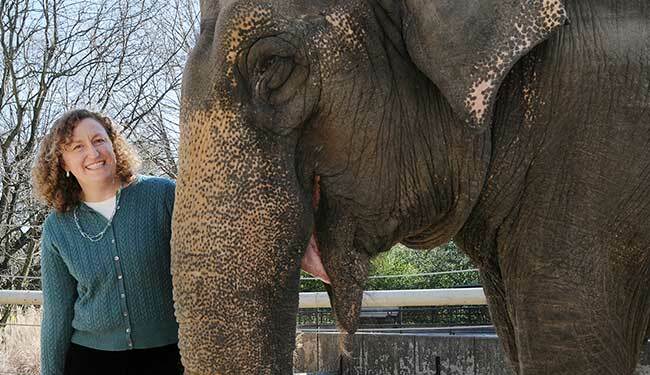 Bob has studied elephant memory and social behaviors at the Indianapolis Zoo for over 10 years – with his students completing 4 Butler Summer Institute Research Fellowships and two honors theses. 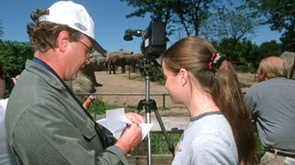 Dr. Dale has served on several committees and participated in Project Elephant at the Indianapolis Zoological Society, Inc. His bachelor’s degrees are in physics (McGill University, Canada) and psychology (Oxford University, England), and his master’s and doctoral degrees in psychology were earned at Dalhousie University (Canada) and the University of Western Ontario (Canada), respectively. His postdoctoral fellowship was at Duke University (USA). Dr. Freeman is an Assistant Professor of Conservation Studies in New Century College at George Mason University (GMU). Elizabeth received a B.S. in Biology from Vanderbilt University, a M.S. in Biology from Virginia Commonwealth University, and a Ph.D. in Environmental Science and Policy from George Mason University. She is a behavioral endocrinologist whose interests involve conducting innovative research that generates data that can be used to enhance the reproductive success of endangered species and aid conservation management of both in situ and ex situ populations. As such, she has over 10 years of experience conducting behavioral analyses on a wide range of species from a parasitic wasp to elephants and rhinos. This includes experience conducting elephant and black rhino research in Addo Elephant National Park, South Africa. Dr. Freeman is an affiliated faculty member to the Zoo and Aquarium Leadership graduate program, the Mason Center of Conservation Studies, and the Environmental Science & Policy department at GMU. She also holds a Research Associate position with the Smithsonian Conservation Biology Institute (SCBI). Elizabeth enjoys teaching conservation courses and sharing her passion for wildlife while mentoring undergraduate and graduate students. Joan Galvin is a lobbyist and consultant for The Livingston Group, a lobbying and marketing firm located in Washington, D.C. and also serves as Executive Director of the Animal Exhibitors Alliance, a non governmental organization representing the interests of commercial animal exhibitors. Galvin has served as Vice President of Government Relations for Feld Entertainment, Inc. In her seven years with Feld Entertainment, Ms. Galvin focused on overseeing legislative and regulatory issues at the local, state, federal and international level. She participated in formulating marketing and public relations strategy for the Ringling Bros. and Barnum & Bailey brand as it pertained to the exhibition of animals and often served as media spokesperson. Prior to that, Ms. Galvin served as legislative advisor to two Members of Congress. Ms. Galvin has regularly participated as a Non Governmental Observer (NGO) to the Convention on International Trade in Endangered Species (CITES) and the Convention on Biodversity (CBD). 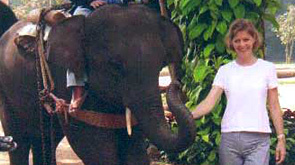 She represented the Ringling Bros. Center for Elephant Conservation at the 1998 World Wilderness Congress Symposium on Asian Elephants in Bangalore, India and successfully lobbied for enactment of the Asian Elephant Conservation Act of 1997 to direct US and private sector funds to in situ habitat conservation projects and for annual appropriations to the fund; Ms. Galvin also served as a founding Board Member of the International Elephant Foundation, a nonprofit foundation organized to provide financial support and expertise to elephant conservation efforts globally. Ms. Galvin has made presentations on elephant conservation to the American Zoo and Aquarium Association (AZA) and the Elephant Managers Association (EMA) and was a featured speaker at the European Circus Association’s annual meetings in Monte Carlo, Monaco in 2003 and 2004. Rob Hunter is the Manager of Regulatory Affairs with Provetica Animal Health. He received his B.S. in Animal Science from Angelo State University, a M.S. in Veterinary Physiology from the Texas A&M University, and a Ph.D. in Veterinary Pharmacology from Louisiana State University. Since completing his Ph.D. he worked as an Assistant Professor of Veterinary Pharmacology in the College of Veterinary Medicine at Kansas State University prior to joining Elanco Animal Health, here he held various roles in R&D and Regulatory Affairs. He became the Chief Scientific Officer at Parnell and was responsible for R&D, Regulatory, Clinical Sciences, and Business Development. In his role at Provetica, Rob is responsible for all animal studies and regulatory interactions. He has authored over 70 peer reviewed manuscripts and book chapters, of which more than half are related to zoological and elephant pharmacology. He is currently a member of the Elephant Stakeholder Steering Committee on tuberculosis. He has previously served on the Indianapolis Zoo and Topeka Zoo Research Boards and as a reviewer for AZA CEF grants. Rob is also a member of the Editorial Boards for the Journal of Veterinary Pharmacology & Therapeutics and the Journal of Zoo & Wildlife Medicine. Mike produced the first Asian Elephant North American Regional Studbook in 1985 and continues to serve as the Studbook Keeper. He served on the Association of Zoos and Aquariums Elephant Species Survival Plan (later the Elephant Taxon Advisory Group and Species Survival Plan) for 25 years, coordinating the activities of the group for ten years as the Chair. He is a member of the World Conservation Union (IUCN) Conservation Breeding Specialist Group and the Asian Elephant Specialist Group. Dr. Wendy Kiso is the Director of Conservation and Research at the Ringling Bros. and Barnum & Bailey® Center for Elephant Conservation. She obtained her B.S. in Biological Sciences from the University of California, Irvine. She is a graduate of the Exotic Animal Training and Management Program at Moorpark College, after which she received a Master of Natural and Applied Science degree from Missouri State University. Dr. Kiso received her Ph.D. in Environmental Science and Public Policy at George Mason University in partnership with the Smithsonian Conservation Biology Institute in Washington, D.C. Currently, she is responsible for conducting and collaborating on all conservation and research projects towards the biology and care of the endangered Asian elephant. 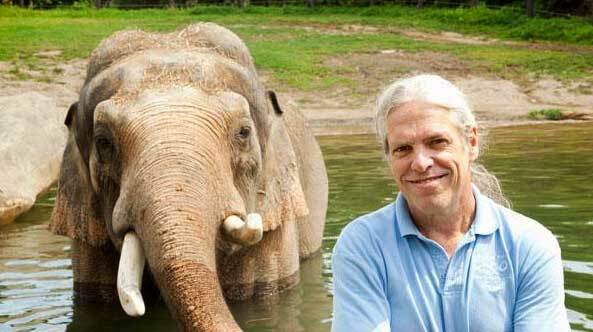 Harry Peachey began his career with elephants at the Indianapolis zoo in 1974 and began working at the Columbus Zoo in 1976. 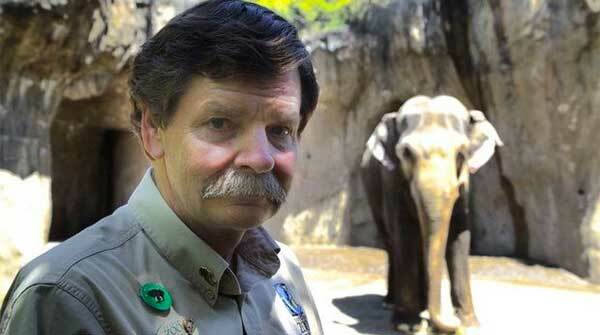 In 1987, Harry was promoted to the Zoo’s Elephant Manager and Head keeper of Pachyderms. During his cumulative of almost 40 years of experience with captive elephant management, Harry has worked with both Asian and African elephants, including males of both species. During his tenure at the Columbus Zoo, Harry has traveled to both Asia and Africa, often in conjunction with in situ conservation projects that have received support from the Columbus Zoo, and has been fortunate enough to come into contact with both wild and “domesticated” elephants. In April of 1998, he spent several weeks in Indonesia, a portion of his time in Jakarta meeting with government officials in both the CITES Office and the Department of Forestry. In April of 2000, Harry served on the Steering Committee for a meeting held in Bogor, Indonesia to review the problems facing elephant conservation in Sumatra. Since his return from Indonesia and his exposure to the difficult circumstances confronting both the Elephant Training Centers and in situ elephant conservation in Sumatra, issues which have been complicated by the economic crisis in Asia, Harry has been actively involved in fundraising to support veterinary care for Sumatra’s captive elephant population. Harry has also served as an elephant consultant to several other zoos. Harry served as a member of the Board of Directors for the Elephant Manager’s Association, and is currently a member of the AZA Elephant TAG/SSP Management Group. 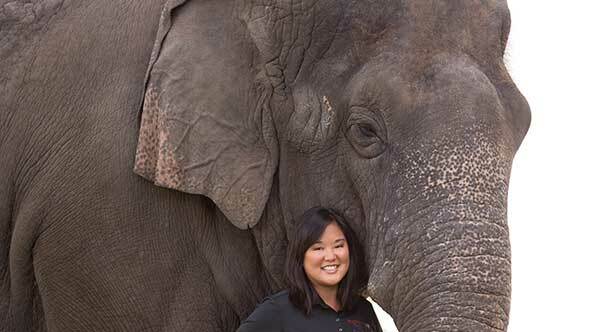 Heidi Riddle is the co-founder and Director of Operations at Riddle’s Elephant and Wildlife Sanctuary, a unique Arkansas nonprofit organization dedicated to both Asian and African elephants. It is the first and only facility to accept any elephant in need, and to provide them with a peaceful, permanent refuge. The sanctuary is a well-respected international leader in elephant management, education and conservation. Ms. Riddle developed and instructs at the annual international School for Elephant Management attended by elephant handlers from institutions worldwide. 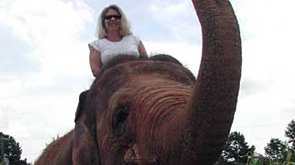 Ms. Riddle also co-founded the annual Elephant Ultrasound Workshop for wildlife veterinarians. 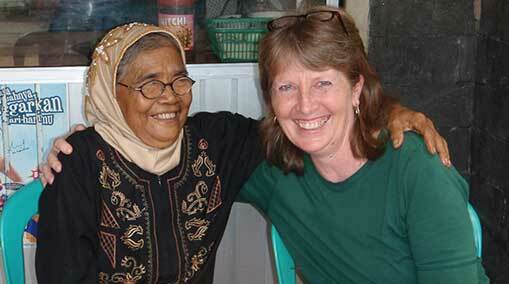 In 2001, Ms. Riddle was invited to join the Asian Elephant Specialist Group of the International Union of the Conservation of Nature (IUCN). The group’s mission is to work toward’s conservation of Asian elephants worldwide. Dr. Bruce A. Schulte is a Professor and the Department Head of Biology at Western Kentucky University in Bowling Green, KY. Before his 2009 start at WKU, he was a faculty member in the Biology Department at Georgia Southern University and before that at Providence College. He received his B.S. in Biology from the College of William and Mary, his M.S. from the University of Southern California and his Ph.D. at the State University of New York – College of Environmental Science and Forestry. His doctoral work was on the North American beaver. He studied with Dr. Dietland Müller-Schwarze who was a student of Konrad Lorenz. Dr. Schulte did postdoctoral research with Dr. Bets Rasmussen, which started their collaboration on elephant communication that lasted until the death of Bets in 2006. He has continued to collaborate on elephant research with Dr. Tom Goodwin, a chemist at Hendrix College, and Dr. Elizabeth Freeman at George Mason University. Dr. Schulte started research on African elephants while at Providence College and over the past eight years has conducted studies in South Africa and Tanzania. 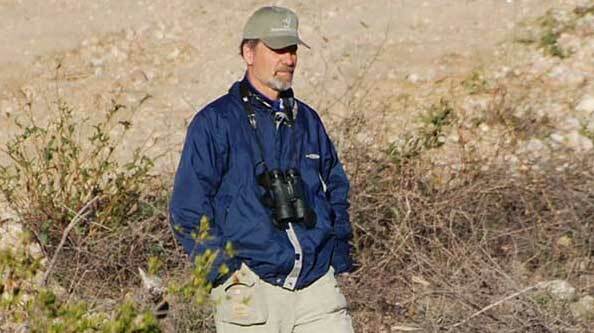 His interests are in the areas of animal behavior, behavioral ecology, chemical ecology and conservation. He examines the development of social and reproductive behaviors as well as the mechanisms, especially chemical that mediate these interactions. In addition to beavers and elephants, he also studies the behavior of manatees and horses. In recent years, he has taken more of a conservation behavior approach, as he works to reduce human-wildlife conflict through a better understanding of the behavioral ecology of these species, specifically their modes of communication, reproductive patterns and social systems. His team includes undergraduate students, graduate students, high school teachers, colleagues, volunteers, managers and local villagers. He welcomes the opportunity to be an IEF Advisor. Laura is an environmental lawyer-lobbyist currently serving as the Director of International Environmental Resources SPRL, located in Brussels, Belgium. Laura specializes in the field of international environmental law and policy, focusing on multilateral environmental agreements concerning in situ and ex situ conservation, international movement of endangered species, access to genetic resources, alien species, biosafety, and biotechnology. For over ten years, Laura has assisted companies, associations and non-profits to access and address issues of concern at international conferences including CITES, the convention on Biological Diversity, and the Aarhus Convention on Public Information and Participation in Environmental Matters. Laura’s work also includes providing assistance to institutes and organizations engaged in public display of animals concerning regulations and legislative developments in the European Community and its 25 Member States. She currently serves as the Permanent Representative of the European Circus Association in Brussels. Prior to establishing her consulting company, Laura practiced law for 8 years with the firm Akin, Gump, Strauss, Hauer & Feld, L.L.C. in its Washington DC and Brussels offices. With this expertise, Laura has represented the International Elephant Foundation for the last four years at CITES conferences and related meetings. In addition to her law degree from the Marshall Wythe School of Law and the College of William and Mary, Williamsburg, Virginia, Laura has a Masters in Educational Administration from the University of Missouri, bringing a background in education to IEF.